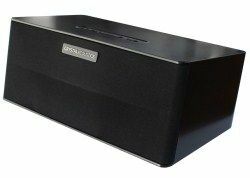 Crystal Acoustics Bluebox adds Bluetooth desktop speaker | What Hi-Fi? Selling for £65, it uses a 2x15W amplifier to power its 7.6cm drivers, and has a bass port to maximise low-frequency response. AVRCP compatibility allows the playback functions of your phone or other Bluetooth device to be controlled from the Bluebox, and the unit is powered from an external mains unit and fitted with a 3.5mm stereo input for the connection of wired players.